Chamelium automates external display testing across VGA, HDMI, and DisplayPort (DP), helping to identify graphics bugs and regressions in a reliable and scalable way. It can emulate user behavior across a wide range of scenarios, such as plugging in (or unplugging) an external monitor before or after suspending, waking, or rebooting a device. It also allows us to simulate all types of displays on the market, at various resolutions and refresh rates, including non-standard or flaky behavior. Chamelium is the public name of the internal Google project Chameleon (similar to Chromium and Chrome). You may see references to the original codename throughout the documentation linked below. 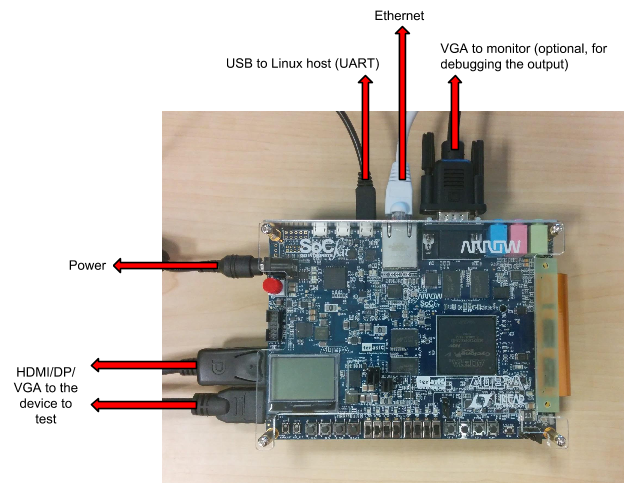 a hardware board which acts as an external display emulator, simulating output over VGA, HDMI, and DP. You can either ask a hardware manufacturer to build these for you, or contact chamelium-external+requests@google.com to request a few units. 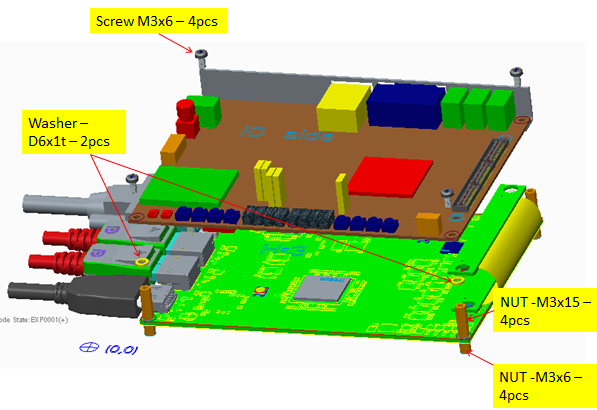 an off-the-shelf FPGA board (SoCKit) to capture the output frames, with a micro-SD card that provides the Linux image and FPGA configuration. This can be purchased from distributors like Arrow or Terasic. Please direct any questions about Chamelium to chamelium-external@google.com. Download tio.image.gz, gunzip it, and dd tio.image onto the micro-SD card from your Linux host. Now insert the micro-SD card into the FPGA board. First, attach the HSMC flex cable to connect the two boards. Note that the longer nuts should be placed in between the two boards, with the shorter nuts on the bottom. Attach the power and HDMI, DP, and/or VGA cables (depending on what interface you’d like to test), per the diagram below. 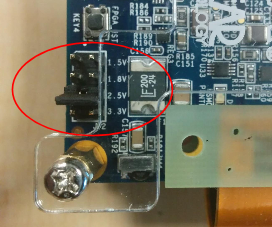 Connect the other end of the HDMI, DP, and/or VGA cable to the device under test (DUT) - the device you’d like to run the tests against. Then connect the mini-USB port in the diagram below to your Linux host. The additional VGA port next to the ethernet port is optional (it’s for debugging purposes only) and should be connected to an external monitor if you decide to use it. Next, connect the ethernet port on the FPGA to the same network as your Linux host and as your DUT. 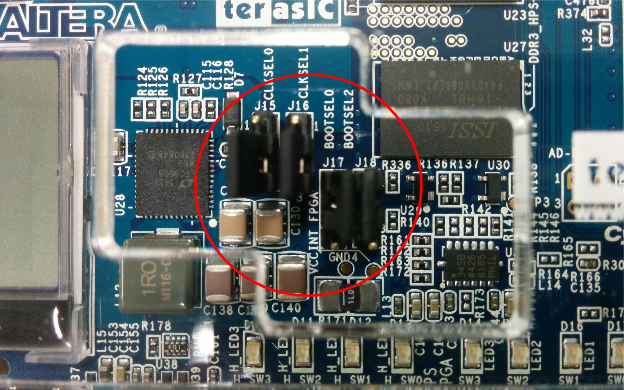 Power on the FPGA board by pressing the red button. This will boot from the SD card. 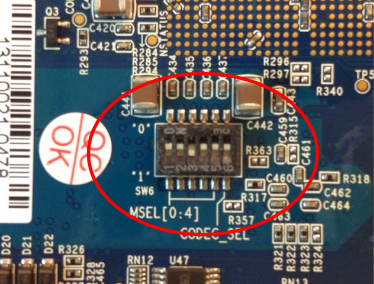 Make sure you can ping the FPGA board from your Linux host, and the Linux host from your FPGA. You may need to setup a DHCP server on your Linux host. Finally, make sure you can ping the DUT from your Linux host. 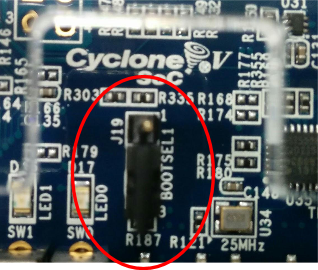 Now, boot your DUT from the USB drive (with the test image) - you’ll need to enter vt2, login as root, and run enable_dev_usb_boot. Then, connect your USB drive to your DUT and restart - you’ll need to enter [Ctrl]-[u] at the developer mode boot screen. After the DUT has booted, switch to vt2, login as root (the password on the test image is test0000) and run chromeos-install . Shutdown the DUT, disconnect the USB drive, and then turn on the DUT. There is no password by default. For security concern, we should set the password. In Chromium OS chroot, copy the public key to FPGA and check it works. Set $TEST_NAME to any of the following. Please note that the starred test items (*) require servo, and will fail without it. Alternatively, you can run an entire test suite by setting $TEST_NAME to either of these values, below. Each suite consists of a combination of the individual tests listed above. Run a test using test_that! For additional instructions on how to modify tests or the FPGA image, please refer to the documentation below.